Jaipur Municipal Corporation aims at conserving the heritage of the city by maintaining and improving the existing infrastructure around heritage buildings. 'Heritage Walks' in the walled city have been made wherein following measures are being taken, under ground cabling of overhead wires, Necessary measures for improvement of facade of the buildings and shops, Basic cleanliness and improvement in sanitation conditions. Built in 1799 by Sawai Pratap Singh. 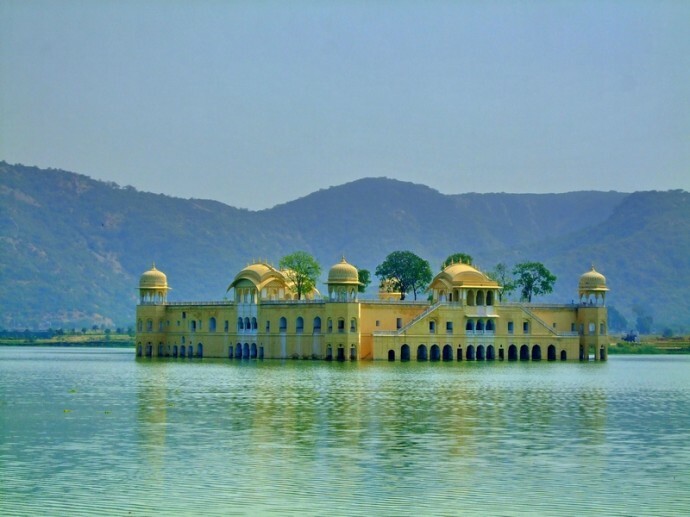 The Jal Mahal 'Water Palace' , Jaipur is noted for its intricate architecture. The Palace was developed as a pleasure spot. The lake is home to a variety of migratory and resident birds. 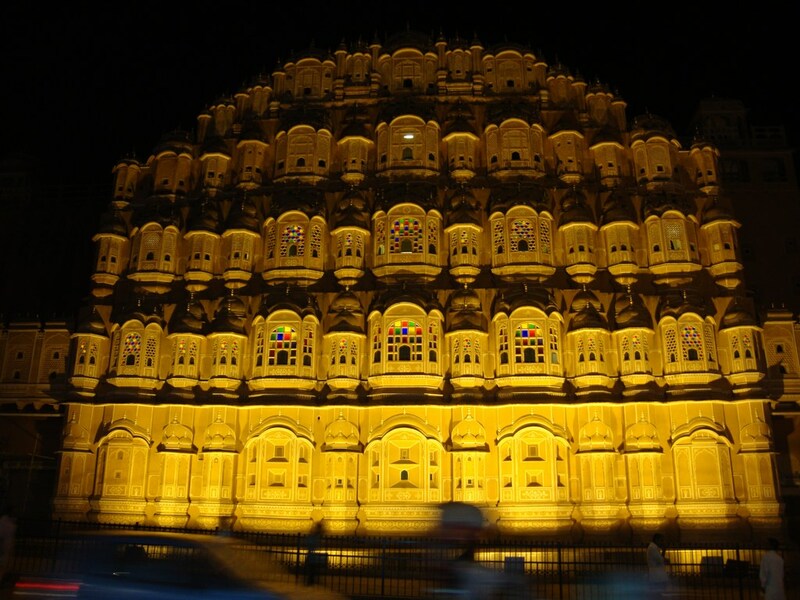 The Palace of Winds 'Hawa Mahal' was built in 1799 A.D. 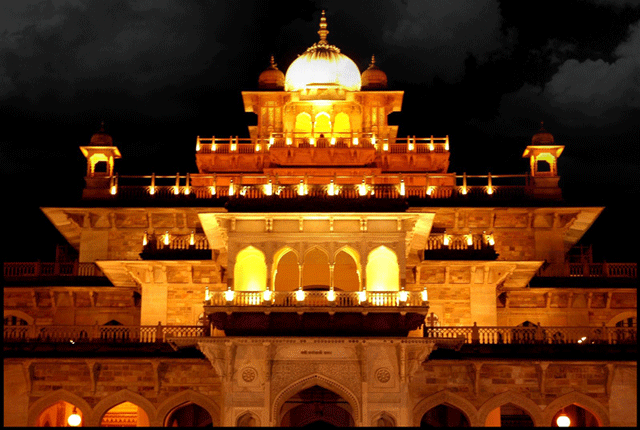 It is a major Rajput landmark. This five storey building along the main street of the old city is in pink splendor with semioctagonal and delicately honey combed sandstone windows. The monument was originally conceived with the aim of enabling ladies of the royal household to watch the everyday life and royal processions of the city. 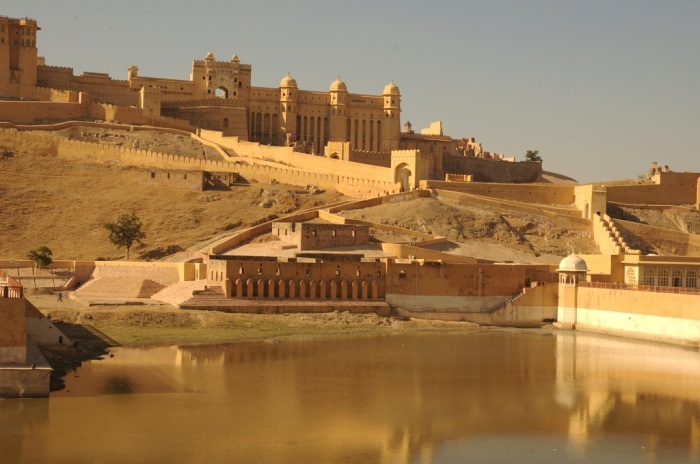 Amber fort of Jaipur has been a pivotal contribution of Maharaja Man Singh I. 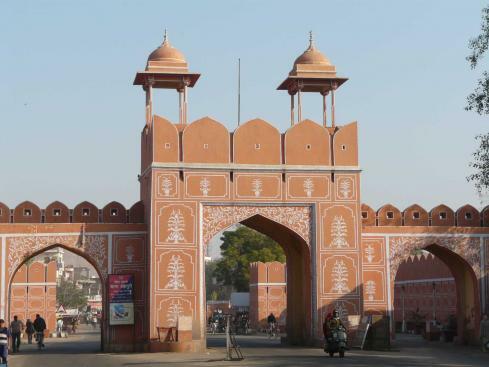 The fort is famous for the Shila Mata temple, Jas Mandir and the astounding Sheesh Mahal. Riding on an elephant and exploring through the palaces, temples and gardens of the fort is an experience so rare and thrilling. 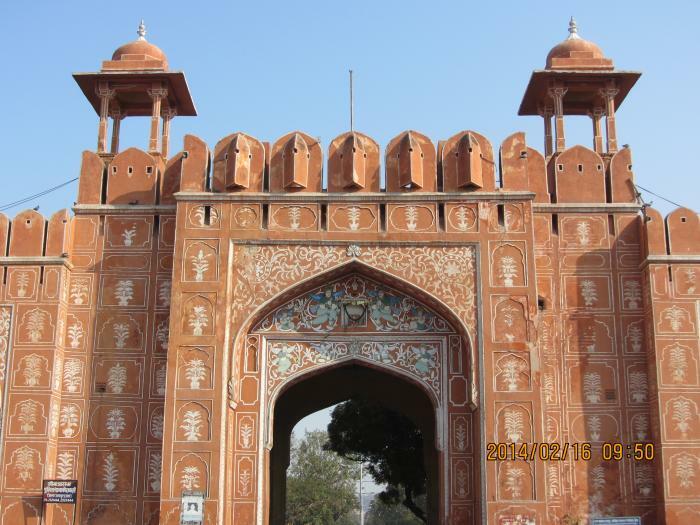 This fort is a blend of both Hindu and Mughal architecture. The internal decorum has been made with exceptional paintings, stones and mirror works. 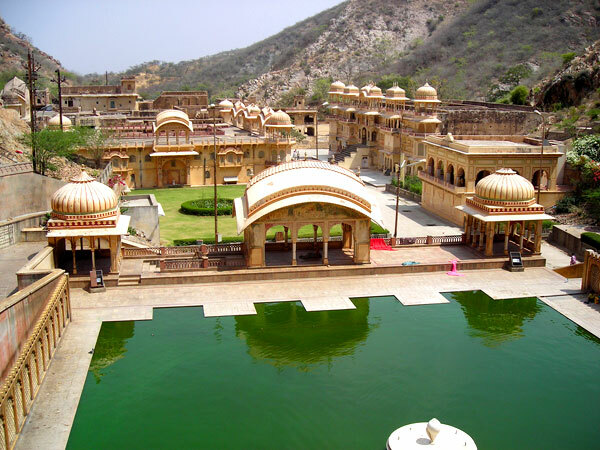 The Jaigarh fort enfolds palaces, gardens, open and covered reservoirs, a granary, an armoury, a well-planned cannon foundry, several temples and a tall tower. 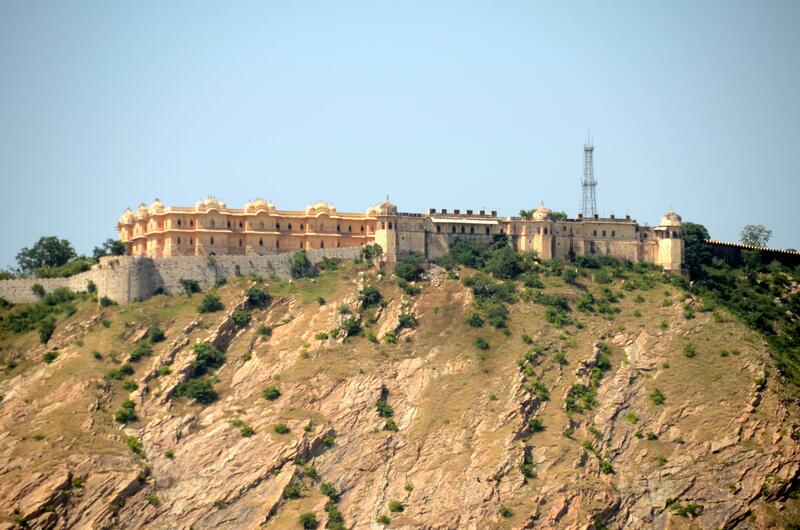 This Jaipur fort is also known as the 'Fort of Victory'. The highlight of the fort is the 'Jaivan Cannon', the world's largest cannon on wheels. Nahargarh the 'Tiger Fort' was build as a means of protective shield for Amer Fort. It was built in 1734 by Sawai Jai Singh II. The strategically planned fort is at its best in the night, dazzling with lights. 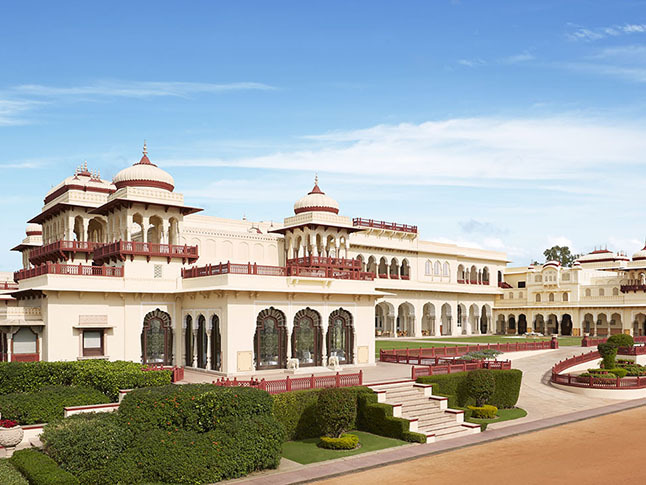 The Ram Bagh Palace built by Maharaj Sawai Man Singh II of Jaipur, is now one of the leading hotels of the world. The City Palace is in the heart of the old city is former royal residence built in a blend of the Rajasthani and Mughal styles. Build by Maharaja Madho Singh II is the 'Mubarak Mahal'. The palace has in it the 'Maharaja Sawai Man Singh II Museum., Diwan-e-Khas (hall of private audience), Dewan-e-Aam (hall of public audience), Chandra Mahal (the moon palace). 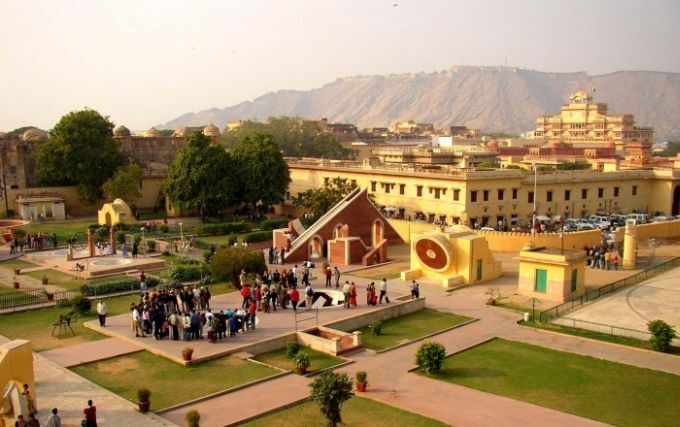 Jantar Mantar was build by Sawai Jai Singh II, a passionate astronomer, the Jantar Mantar is a collection of huge astronomical instruments, one of them as high as 90 feet. It is different instruments for calculation accurately the movement of celestial bodies, the local time, etc. It is the largest stone observatory in the world, providing accurate information, even in comparison to today's modern instruments. Govind Devji Temple: The most popular spireless temple of Jaipur dedicated to Lord Krishna. It is located in the central pavilion of the Jai Niwas Garden to the north of Chandra Mahal. 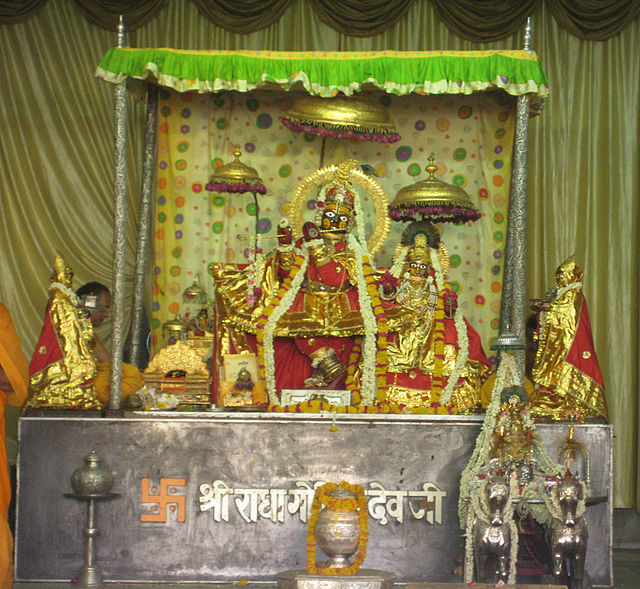 The image of the patron deity-Govind Devji,originally installed in a temple of Vrindavan, was reinstalled here by Sawai Jai Singh II as his family deity. Galtaji: An ancient pilgrimage centre, lying beyond the gardens amidst low hills.Temples ,pavilions and holy kunds (natural spring and reservoirs) along with lush landscape make it a delightful spot. The small temple of the Sun god, built by Diwan Kriparam on the top of the highest peak is visible from all parts of the city. Kanak Vrindavan Garden is nestled in the jungle-clad foothills of the Nahagarh Hills in the idyllic green oasis of Kanak Valley, a former elephant path fringed by the Aravalli Range. Kanak Vrindavan Garden was christened by Raja Sawai Jai Singh, the versatile founder of Jaipur who was mesmerized by the garden's breathtaking beauty and found it similar to Lord Krishna's venerable sanctum at Vrindavan. The garden is a popular tourist spot for pilgrims during Rajasthan's celebrated Teej and Gangaur festivals. 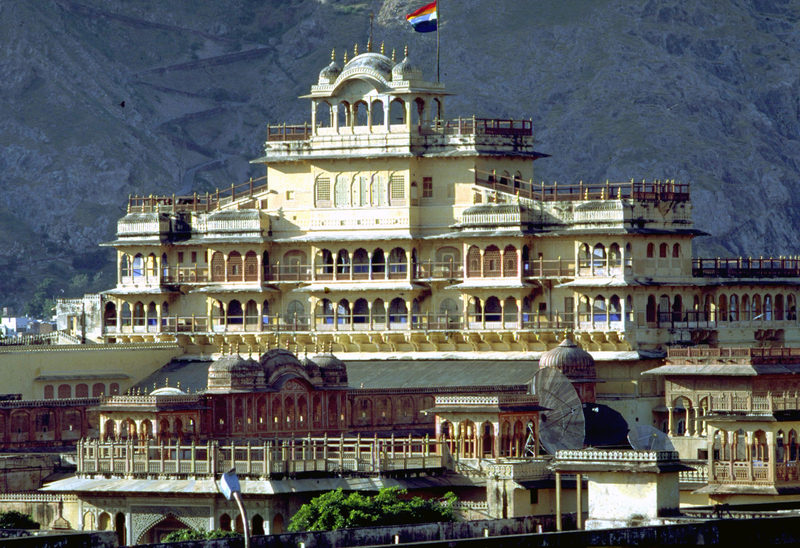 Sisodia Rani ka Bagh is a hallmark of Sawai Jai Singh?s love for his queen from Udaipur. The garden constructed in the year 1728 was a gift that the erstwhile founder of the Pink City gave to his beloved queen. The sprawling landscaped garden is an exquisite blend of traditional Indian and Mughal architecture and is sited at about 8 km from the capital city of Jaipur. 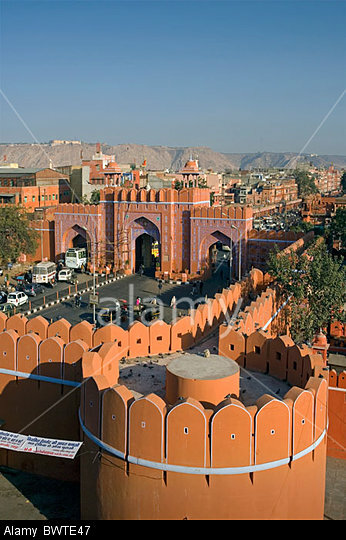 There are Eight gates for entering into the walled city of Jaipur. They are namely, Ajmeri gate, New gate, Sanganeri gate, Ghat gate, Surajpole gate, Samrat gate, Zoravor Singh gate and Gangapole gate. On the pattern of bawaries of Amer, the king of Jaipur ? 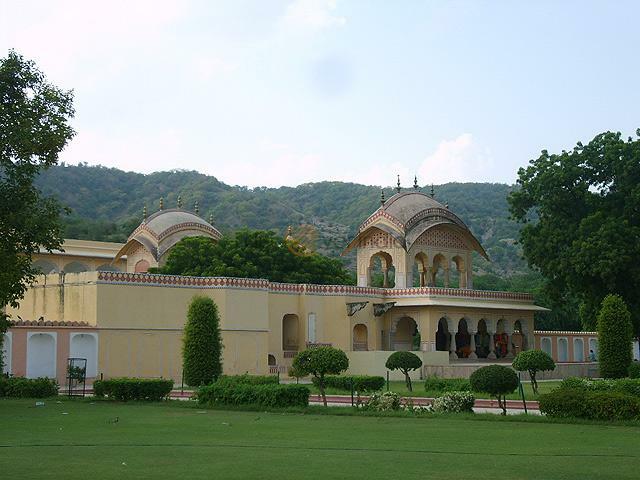 Sawai Jai Singh got constructed many bawaries in various colonies of Jaipur. These bawaries were constructed in the low-lying areas & basins of hills in order to collect the water and form a large catchment area. The famous bawaries constructed in that area were 'Kala Hanuman Ki Bawari' , Two bawaries of Gurjar Ghati namely 'Kalyan ji temple bawari' & near 'AtreyaSchool', in Jai Singhpura Khore, near chullgiri, 7 bawaries of Galta, 'Khon Nagoriyas', 'Jagga ki bawari', Yagnashala ki bawari', 'Parsashramdwara ki bawari' etc., The main purpose of these bawaries was to enable continuous water supply for residents of these areas and also to maintain water level by action of seepage. Rajasthan known as Desert State of India is suffer from scarcity of water. Earlier the problem of lack of water availability was limited to western part of the state only but due to poor rainfall during last few years, the problem of scarcity of water has engulfed whole of the state. The polluted environment, excessive drilling of tube wells, cutting of trees and exponential rise in consumption level of water has further worsened the situation. 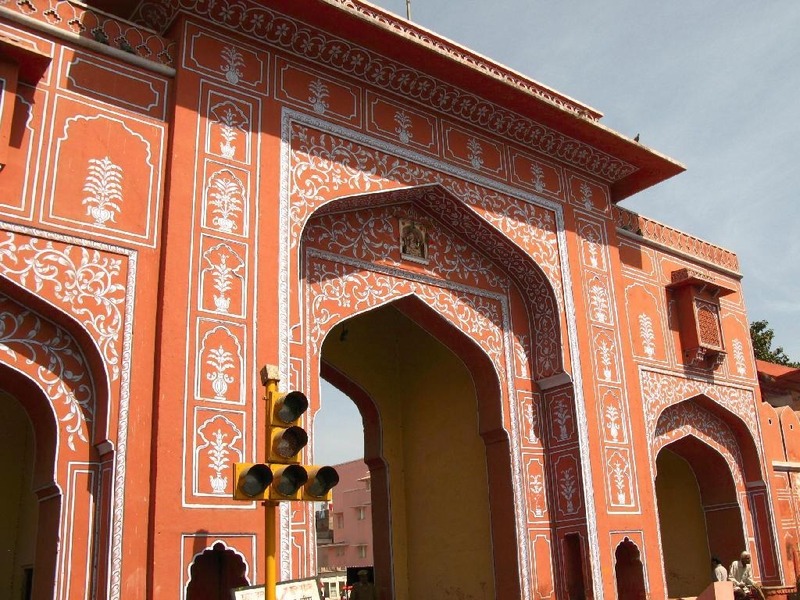 Being the capital of the state, the Jaipur City has always been politically active. Due to rapid urbanization, the demand of water supply has increased many fold. The area of Jaipur is now spread in 625 Sq. Km as compared to 20 Sq. Km about 50 years ago. Large number of new colonies have come up. The people have indiscriminately dug new tube wells, which has reduced the water level drastically. The major water supply source of Jaipur 'Ramgarh Dam' is hardly capable of supplying 5-10% of total population of Jaipur City.